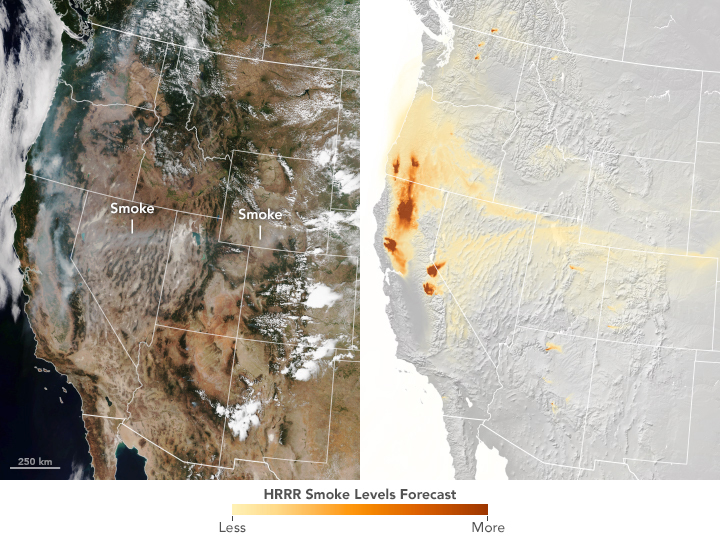 NASA Visible Earth: Which Way Will the Smoke Go? Which Way Will the Smoke Go? NASA Earth Observatory images by Lauren Dauphin, using VIIRS data from the Suomi National Polar-orbiting Partnership and HRRR-Smoke data. Story by Jenny Marder, Joint Polar Satellite System. By the time the U.S. Forest Service declared the Mendocino Complex Fire 100 percent contained in mid-September 2018, it had burned for nearly two months, destroyed 157 homes, and scorched more than 459,000 acres, making it the largest wildfire in California history. Wildfires in the state burned more than 1.3 million acres from January 1 through November 4, shrouding the region and, at times, whole swaths of the country, in smoke. 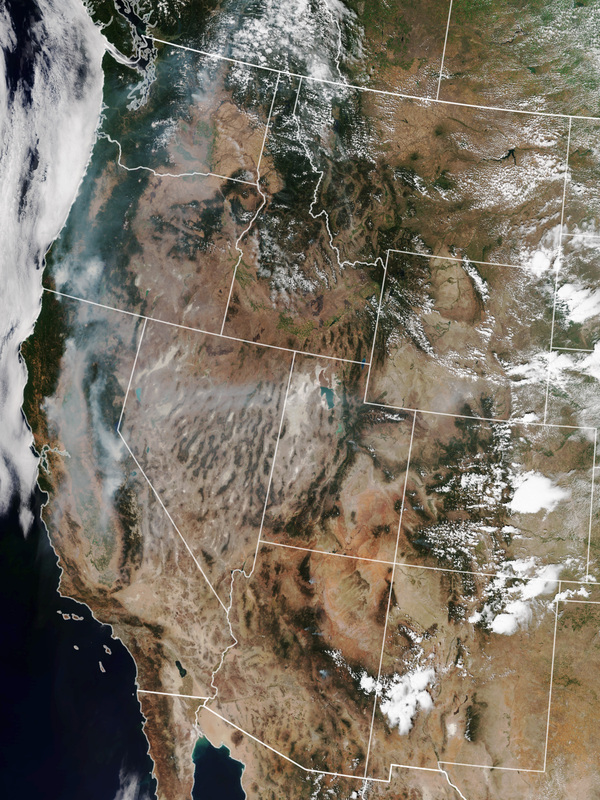 But a new experimental model that relies on data from National Oceanic and Atmospheric Administration (NOAA) and NASA satellites has proven remarkably good at simulating the behavior of wildfire smoke. The High-Resolution Rapid Refresh Smoke model, or HRRR-Smoke, builds on NOAA’s existing HRRR weather model, which forecasts rain, wind, and thunderstorms. It ingests real-time data from the Joint Polar Satellite System’s Suomi-NPP and NOAA-20 polar-orbiting satellites, as well as NASA’s Terra and Aqua satellites. The image on the top left, captured by the Visible Infrared Imaging Radiometer Suite (VIIRS) on Suomi-NPP, shows the Western United States in natural color in the afternoon on August 6, 2018, at the height of the Mendocino Complex Fire. On the top right is a HRRR-Smoke simulation from the same region at the same time. Central to HRRR-Smoke is an important metric called fire radiative power. FRP is a measurement of the amount of heat released by a given fire in megawatts. A large fire, for example, might reach about 4,000 megawatts per pixel (750x750 meters). Calculating radiative power and where it is distributed can help scientists pinpoint the active front of a fire and predict the density and trajectory of the smoke it will emit. The HRRR-smoke model combines FRP data with observations of wind speed, rain, and atmospheric temperature. It also includes vegetation maps because the more scientists know about what is burning, the better the simulation. (For instance, sagebrush burns differently than ponderosa pine.) These measurements are mapped to a three-dimensional grid that extends nearly 16 miles into the atmosphere. What results is a detailed forecast of the amount of smoke produced, the direction it should travel, and its plume height. HRRR-Smoke generates forecasts four times per day and looks ahead by 36 hours. The forecasts include two key sets of predictions. “Near-surface smoke” refers to the smoke that will hover within 8 meters (26 feet) of the ground—the kind responsible for burning eyes and aggravated asthma. “Vertically integrated smoke” depicts all of the smoke in a vertical column, including smoke high in Earth’s atmosphere. That is the smoke you see at sunrise and sunset. The animation below shows a 36-hour forecast of vertically integrated smoke on August 6, 2018. “Near-surface smoke is one indicator of air pollution, but the smoke could also be at much higher altitudes,” said Ravan Ahmadov, the main developer of the HRRR-smoke model, and a research scientist at NOAA’s Earth Systems Research Laboratory and the Cooperative Institute for Research in Environmental Sciences. “That�s important to know, because the smoke could affect visibility for aviation.” High-altitude smoke can also block incoming sunlight, which can cool air temperatures and interfere with solar energy production. HRRR-Smoke is being used increasingly by forecasters and government agencies, but also by some local groups. During California’s Ferguson fire, the Department of Transportation used HRRR-Smoke simulations as part of its decision-making to suspend Amtrak rail service in the region. Likewise, the model was part of the National Park Service calculus when it closed parts of Yosemite. On a local scale, schools in Utah referred to model forecasts when they opted to keep kids inside during recess and to cancel football games due to fires burning south of Provo. In Oregon, a youth swimming coach moved outdoor practice to an indoor pool after hearing the forecast. The HRRR-Smoke model is still evolving. One limitation, Ahmadov said, is that each polar orbiting satellite passes each location in the continental United States just twice a day, and fires can spread and evolve rapidly during the time between those observations. He hopes to eventually incorporate data from geostationary satellites like GOES-16 and GOES-17, which have a lower spatial resolution but would scan the fires more often. The ultimate goal is to add smoke to the regular HRRR model used by the National Weather Service.